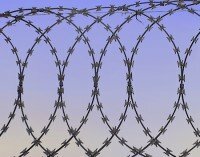 Concertina razor wire is the normal type of Razorwire you see around prisons and high security establishments. Each loop is clipped in 3 or 5 places depending on the coil diameter to the next loop so when it is extended it forms a tubular effect that has gaps too small for someone to climb through. 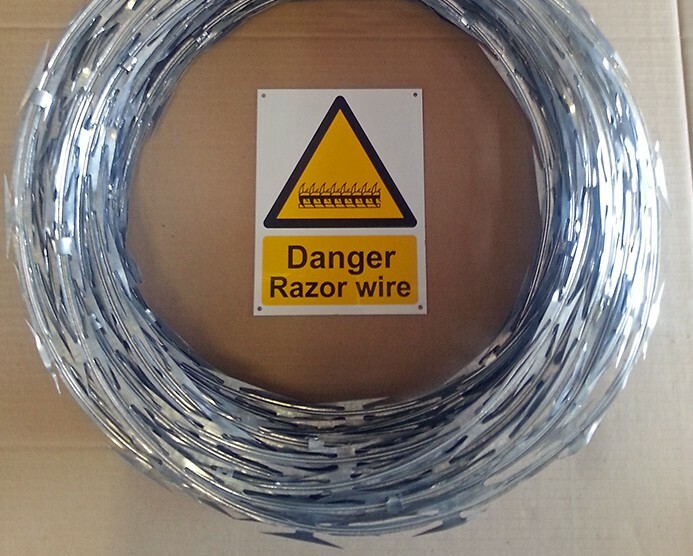 RazorwireUK offer all types and sizes of Razor wire to order, although some types if made to order have a minimum order quantity. 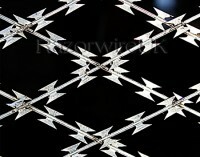 However we generally stock the following most popular forms of Concertina razor wire. 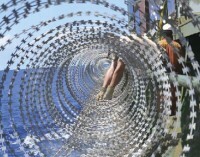 The bigger the diameter the more of an obstacle and deterrent the Razor wire is. 450mm diameter is the smallest size we recommend for domestic type applications. 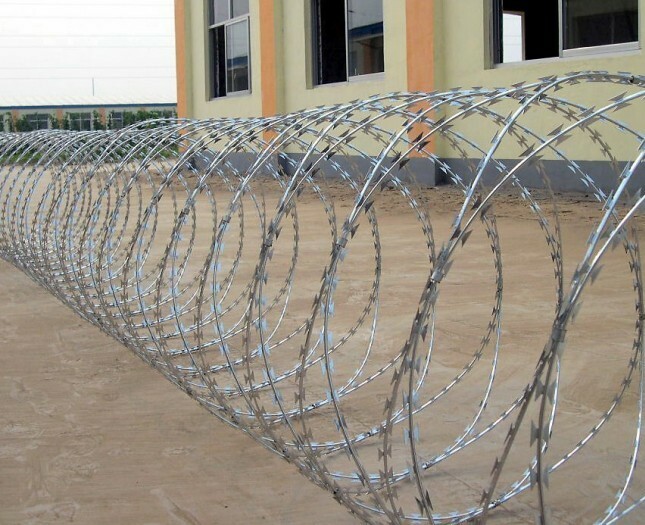 This size is normally an adequate deterrent and also the easiest to fit as standard support brackets will generally do for this diameter and weight of razor wire. 730mm or even 900mm diameter will require specially made brackets for the installation. If fitting to the ground then we would recommend a size that cant be vaulted over, then the suggested options would be to install a single run of 900mm diameter Razorwire or alternatively stack smaller diameter Razorwire on top of each other either vertically or in a pyramid fashion. 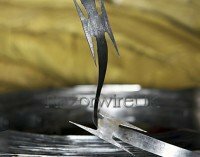 The biggest misconception with handling Razorwire is that cut resistance Gloves and protective clothing are not sufficient, the handler should use the highest level of puncture resistant PPE to prevent injury whilst fitting. We offer our own brand of PPE called Razorpro that is rated to Class 4 puncture resistance which is the highest level of protection available in a material type format. One of the industry ways of maximising profitability is to disguise the specification, if the specification is not stated then you may not be getting value for money! 2.5mm is the industry standard, anything less has proportionately less tensile and inherent strength. This determines the amount of Razorwire on the coil and therefore the profile density when deployed, an important point when comparing prices. All our coils have 55 loops per coil, this means the coils can be extended easily up to 10m whilst maintaining a dense profile of Razorwire. The environment the product is being deployed in may determine whether Stainless Steel or Galvanised is the best option. Stainless Steel is considerably more expensive but offers greater durability especially in salt air environments and over time will outlast Galvanised therefore making it the best long term option in salt air. However Galvanised is more than adequate for most UK regions and applications. We would always suggest you check the level of zinc coating when selecting Razorwire, all our Galvanised products are 200g/m2, if the supplier cant provide the information, you may only be getting a product with 60g/m2 which will deteriorate and rust much more quickly. 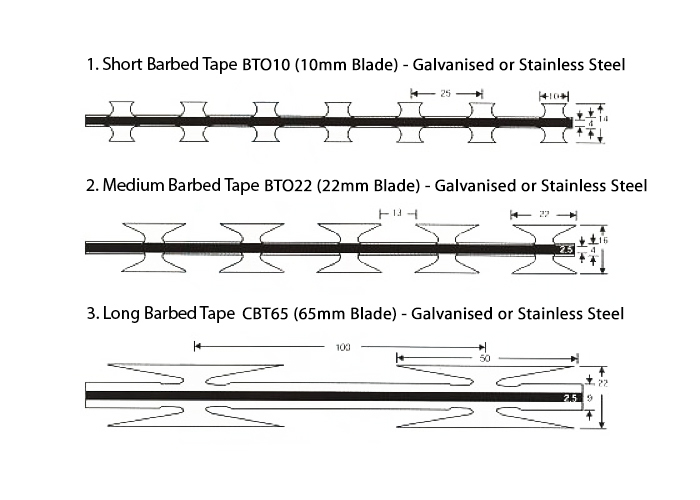 Smaller blades such as BTO10 (10mm) are quite small and therefore less of a deterrent, larger blade profiles such as CBT65 (65mm) are much more effective but the blade type will also be reflected in the price. 0.5mm is the industry standard, anything less is likely to bend easily.